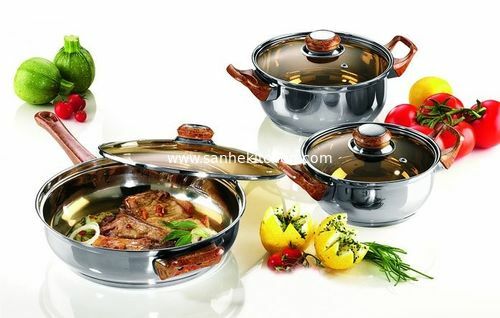 1, due to the stainless steel small coefficient of thermal conductivity, heat slowly, at the bottom of the temperature, easy to focus so shoulds not be too great firepower when using stainless steel tableware, should make bottom heating surface is wide and even as far as possible, so that both can save fuel and can avoid burning pot food. 2, if you have food caking, burning a pot can be soaked with water and then scrape gently with the bamboo, wood, must not a kitchen knife and other sharps chipped; After wash for soft cloth to wipe dry place after dry place. 3, stainless steel kitchen utensils should avoid collisions with sharp hard objects, lest produce scratch mark flat affect beautiful and sealing performance. 4, stainless steel kitchen utensils in use after a period of time, the stainless steel surface a layer of fog, will make tableware surface. At this time can use soft cloth with household cleanser or detergent KaiMa, namely, can resume shine. If its outside surface by smoke blackened, also can use this method. 5, in the use of stainless steel pot, don't let the bottom of the pot with water damage. Especially when used on coal furnace due to coal containing sulfur, sulfur dioxide and sulfur trioxide combustion would produce, it will be generated in a encounter water sulfurous acid and sulfuric acid, the corrosion effect to the bottom of the pot. Stainless steel kitchen utensils and appliances/utensils and other metal utensils, mostly by heating to black. To avoid this kind of reaction, it is important for new tableware surface treatment, as long as before use in tableware surface coated with a small amount of grease, such as peanut oil or animal fat, when cooking food to heat the mixture gently for a period of time, to be tableware surface with a layer of oil oxidation film, again according to your need to normal use. If you don't appear dry pot burning phenomenon, it wouldn't turn black again.